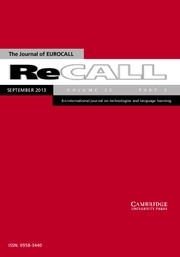 ReCALL is a fully-refereed journal published by Cambridge University Press on behalf of EUROCALL. It is available online three times a year in January, May and September and paper copies are also issue to subscribers who specifically request them. The journal contains research articles that report on empirical studies (quantitative or qualitative); provide rigorous meta-analyses or other syntheses; contribute to theoretical, epistemological or methodological debates; or present and critique new design approaches -- all in areas relating to technology in language learning and teaching. ReCALL is available to individual EUROCALL members. Libraries are encouraged to subscribe directly with Cambridge University Press. Members of EUROCALL can access all past issues of ReCALL by logging in to Cambridge Journals Online using their EUROCALL I/D as their password. As of 2018, ReCALL no longer accepts reviews of websites, software, apps, books or other material. However, proposals can be submitted to The EUROCALL Review; please see https://polipapers.upv.es/index.php/eurocall.